If it concerns event attendees sitting down, we're interested! Event seating rental is a core part of our business. From graduations to sporting events, parades to corporate events, we've provided safe seating layouts and options that include ADA access and patron safety egress routes across North America. PM1 teamed up with BilJax (the most trusted name in bleachers) to provide a brand new premium stadium flip seat (also called a tip-up seat in some circles). A black, 20" width seat sits on a modular understructure allowing us to build over uneven terrain in different setups for any type of event. If you're selling tickets to a sporting event or putting executives in a room to full capacity, our flip seating will keep your event attendees engaged. 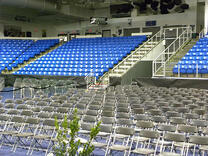 For more information check out our Stadium Flip Seating Rental Options | Stadium Tip-Up Seating Rental Options. From folding plastic to resin to fan-backs to padded banquet chairs, our chair rental service is perfect for events from 10 to 10,000. For more information check out our full lineup of our Chair Rental Options. When elevated seating is a necessity our premium bleachers provide a quick way to elevate event attendees and provide sightlines that you need for your event. With our premium "Super Bleachers" we've provided options of events from 100 to 10,000 attendees. Available as ground-start or elevated grandstands, these units create massive event capacity with interior aisles and guardrails for safety. For more information, check out our Bleacher Rental Options. A premium seating option for high-end events, audience risers can be created with event seating in a variety of options including layouts for theatre, classroom desks, or dinner tables in straight, curved, and over uneven terrain. Floor surfaces can be carpeted for indoor events and fiberglass for outdoor events. For more information check out our Audience Riser Rental Options. When adding elevated seating to events, it's important to include options for ADA access. Easily add platforms and access ramps to any existing seating or integrate ADA options into our large-scale bleachers, flip seating and audience risers. For stand-alone ADA platforms, we offer zero-barrier entry and continuous-handrail ramps for elevations of up to 24". For elevations over 24", switch-back style ramps with resting areas are utilized. PM1 also stocks self-operated battery-powered lifts for access to existing structures where ramps aren't an option. These can go to 48" heights and placed together to reach a total of 96" with a resting platform where necessary. For more information check out our ADA Ramps, Lifts and Seating Rental Options. There has been an explosion in elevated VIP seating sections for ticketed events. Whether you need elevated seats on sidelines or over existing theater seats, we've got options for any layout. Whether you're adding seats, couches, additional furniture or bottle service areas to your event, add them easily. For more information check out our VIP Seating Rental Options. In our industry longevity is everything. With hundreds of combined years across our staff's experience, we bring you a collective breadth of knowledge, equipment, logistics and how-to that is nearly impossible to beat. If you're ready to get pricing, or just want to start discussing options for your next event contact us today.